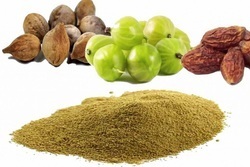 Triphala is a powerful herbal remedy that consists of Haritaki, Bibhitaki and amla. It is used in traditional Ayurvedic medicine to prevent disease and treat a number of symptoms, including constipation and inflammation. Triphala is an Ayurvedic herbal rasayana formula consisting of equal parts of three myrobalans, taken without seed: Amalaki, Bibhitaki, and Haritaki. We are ranked amongst the most trusted firms deeply engaged in offering a wide range of Triphala Vati. When you get best Ayurvedic herbal formulation of three fruits Amalaki (Emblica officinalis), Bibhitaki (Terminalia belerica) and Haritaki (Terminalia chebula) then this amazing combination makes Triphala. Your very own balancing formula of Detoxification and Rejuvenation. We are one of the leading organization engaged in exporting a wide range of triphala which is sourced from reliable vendors of market. Besides, these vendors are known for hygienic processing of triphala. Further, it is provided in tamper proof packaging which ascertains the freshness and purity of triphla juice. 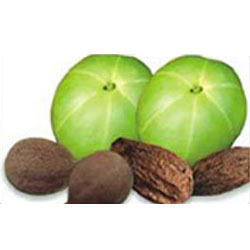 Our company has gained name and fame in presenting Triphala Ayurvedic. Extremely beneficial in treating constipation, liver disorder, rythymicity of the heart.Powerful eye tonic, Triphala energizes the body. Brand: Anuphala New form of Triphala, Micro processed Bio-enhanced & stabilized. - Effective Eye tonic, Blood purifiers and mild laxative. - Anti oxidant, Immune booster and Anti Bacterial. - Bio-enhanced with Pippali (Bio-availability enhancer).